This is a “local” beer, well as so much as Jersey has breweries. Brewed in Lambertville NJ and last time I was there it was not a very impressive brewery tour. Luckily their beers are much better then the brewery tour. 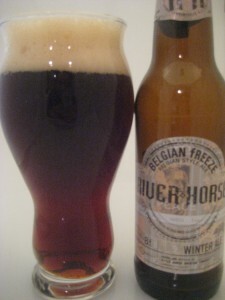 Tonight I’m drinking their Belgian Freeze ale which is a Belgian Style Dark Ale. A good average pour, about 45 deg, will give a nice hearty head. Although his beer was fairly carbonated, it didn’t pour with a huge head. So, give the beer a more of a straight pour to get a nice inch or so head. Beer was a deep mahogany with a lush think creamy head. The Belgian Freeze ale had excellent head retention, as a result some real nice lacing occured. The aroma was kind of a surprise. The was almost no perceptible aroma. I had to take several big whiffs to get a very mild bready/malty caramel sweetness. Overall this was one the drawbacks of the brew. The dominate flavor was caramel malt sweetness with an underlying cherry flavor and touch of pepper. The finish had a fairly strong alcohol taste. I rather enjoyed it; it left you warmed like scotch or brandy. Every once in awhile I got a nice nutty flavor, it would have been nice to bring out that flavor a bit more. I like this one too but it seems to be a hybrid Belgian. It’s actually on tap at the Shipwreck Grill….2 minutes away from me!